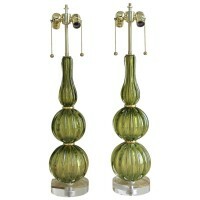 Pair of fabulous Murano thick handblown absinthe (green) colored ribbed table lamps by Seguso. Mounted on new custom acrylic bases with double cluster solid brass fittings, giltwood spacers and French-style rayon covered cords. Newly wired. Measures: Overall height 30″, glass portion 20″, widest 6″.